I am pleased to announce our next medicine drum making workshop running in East Gosford, on the Central Coast of NSW. The medicine drum is also known as the “shamanic drum”. 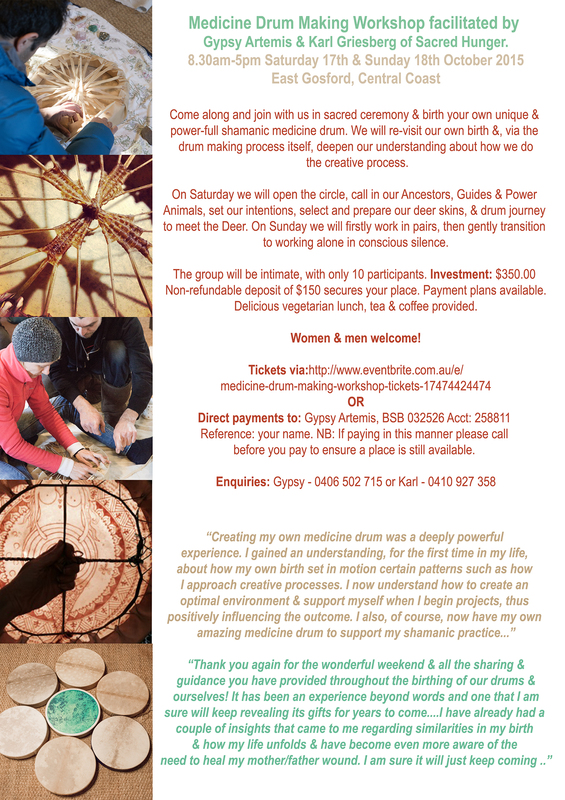 The foundation of the workshop & the drum making process revolves around exploring, unpacking, and understanding your own birth. My teacher, Jane Hardwick Collings suggests that by revisiting our birth (our first rite of passage) we can better approach, understand, and process other rites of passages…such as birthing our babies and birthing projects. (Even if you have birthed before, every subsequent birth matters!) So this workshop would be extra awesome for pregnant mammas and dads…..and those wanting to deepen their understanding of how they “do the creative process”.